1. Place 500ml water with the coffee beans, cocoa powder and salt in a small saucepan, over a medium heat, and simmer for 5 minutes. Remove from the heat and cover with a lid or clingfilm. 2. Place the sugar in a stainless steel saucepan over a medium heat and allow to melt. Do not stir until you see the sugar around the edges has melted, then, using a spatula, carefully mix it with the unmelted sugar. 3. When all the sugar has become a golden brown caramel, reduce the heat and slowly pour in the warm coffee mixture, stirring continuously. The mixture should automatically boil from the heat of the sugar, so be careful of the steam. 4. Add the chopped chocolate and mix well until the chocolate has melted. Remove the pan from the heat and pass the sauce through a fine sieve. Pour into a jug and serve warm. 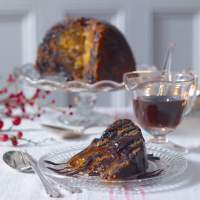 This sauce is perfect with Heston's Hidden Orange Christmas Pudding.